Final Fade Out est la dernière version de ATZ sortie en 2012. Elle utilise les mécanismes de Chain Reaction 3.0. Take a look at the rules and minis deal we have just for you! Final Fade Out is the final version of ATZ. The basic book to get you started and all the others are compatible supplements to expand your Final Fade Out games. ZOMBIES. YOU KNOW WHAT WE’RE TALKING ABOUT. Who knows and who cares? When you meet your first Zombie or see your first Zombie Feast all those questions disappear. All you care about is staying alive. And that’s what All Things Zombie – Final Fade Out is all about, staying alive. 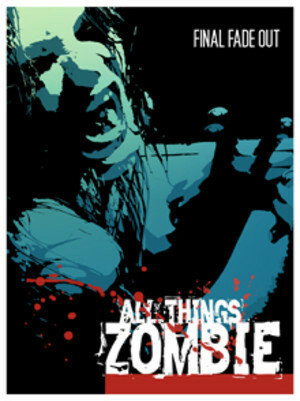 All Things Zombie - Final Fade Out picks you up and sticks you right in the middle of a catastrophic zombie outbreak. Where you are, is just as important as who you are, when the outbreak occurs. Because unlike other zombie games, where the zombies have been around for a while, you won’t be able to tell the survivors from the zombies until maybe it’s too late. Hell, they could even be a relative! Because it’s all happening to you just like it would on Z Day - 1. Confusion, chaos, and lack of information are just some of the challenges you’ll face when the world starts to crumble. Will you have what it takes to survive the first 30 days? After that it’s all up to you. Maybe you want to rebuild the world, as you knew it; except maybe this time with you in charge.